School psychologists are uniquely qualified members of school teams that support students' abilities to learn and teachers' abilities to teach. They apply expertise in mental health, learning, and behavior, to help children and youth succeed academically, socially, behaviorally, and emotionally. School psychologists partner with families, teachers, school administrators, and other professionals to create safe, healthy, and supportive learning environments that strengthen connections among home, school, and the community. School psychologists typically complete either a specialist-level degree program (at least 60 graduate semester hours) or a doctoral degree (at least 90 graduate semester hours), both of which include a yearlong 1,200-hour supervised internship. School psychologists must be credentialed by the state in which they work. They also may be nationally certified by the National School Psychology Certification Board. NASP sets standards for graduate preparation, credentialing, professional practice and ethics. 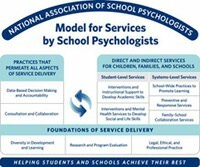 The NASP Practice Model outlines the comprehensive services that school psychologists are encouraged to provide. School psychologists can provide expertise on issues facing schools and students such as learning disabilities, mental health issues, school safety and crisis prevention, and more. Please contact us to request an interview with a member of the association.